CRAMSTER MX3 GLOVES REVIEW | IAMABIKER - Everything Motorcycle! 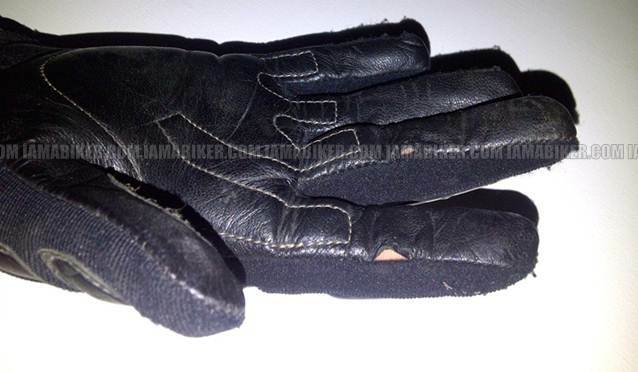 Gloves are an integral part of a biker’s riding gear. One of the first investments recommended after a good snug helmet is a decent pair of riding gloves. There are several types of riding gloves available in the market and prices vary depending on the manufacturer. Having used the MX3, an entry-level riding glove offered by Cramster, for over a year, there is both a feeling of satisfaction and regret in having bought the gloves. The MX3 have been designed to make it comfortable for everyday use. The gloves boast of carbonknuckle protection and genuine leather palms, which Cramster claims to be more durable than synthetic leather. The gloves also have moulded strips on the fingers to save from abrasions. Sadly, for those looking to match their gloves with their bike’s colour, the MX3 only come in a black and grey combo. The gloves are perfectly designed and after the initial break-in, take on the shape of the hand well. The knuckle protection too, is placed adequately and has good padding on the inside. This creates a soft cushion and does not lead to any form of discomfort during long rides. The genuine leather on the palms is definitely a boon, the material is soft enough, making it comfortable to wear, and tough enough to withstand impact. The velcro straps clasp the wrist nicely and are of good quality. The gloves have good ventilation and even on a hot summer’s day, they feel airy while on the move. However, ventilation also means that the MX3 are meant only for dry use. They get heavily soaked if worn in the rains and do take sometime before they can dry up. However, when it does pour, the gloves do offer much better grip on the accelerator than when riding bare-handed. The gloves priced at Rs. 1,100 definitely seem like a good option, except that there is one teething problem with the MX3 that hopefully Cramster has addressed. The stitching at the end of the fingers had a tendency to wear out very quickly. Several complains about the same were seen on online forums. A small part of my gloves’ stitching too had come undone within six months. Although, it did not create any problem, it was just annoying to see the loose stitches. To sum up, the Cramster MX3 is a decent package for those looking to buy gloves for everyday use at a reasonable price. However, the reason I regret my purchase is that I believe that I should have invested a bit more and gone for gloves that offer better protection. Currently, gloves called Blaster are available from the Cramster range and seem like a better buy if one is ready to shell out a bit more from his/her pockets.